Rebić made his debut for the first team against Dinamo Zagreb on 21 May 2011 in the last round of the 2010–11 Prva HNL as a second-half substitute. The match ended in a 1–1 draw, with Rebić scoring the late equalizer. In August 2011, Rebić signed a professional three-year contract with RNK Split. In the 2011–12 season, Rebić scored five league goals in twenty appearances, four of them when coming off the bench. In the 2012–13 season, Rebić scored ten league goals in twenty-nine appearances. Performing extraordinarily well in both club and national team, Rebić drawn much attention from both the media and football world, resulting in interest from a number of clubs, including Fiorentina, Tottenham Hotspur and Swansea City. On 28 August 2013, Rebić signed a five-year contract with Italian side Fiorentina, for an undisclosed fee. Upon passing the medical exams, he was given the number 9 shirt. He made a debut on 30 September, coming on as a 36th-minute substitute for injured teammate Giuseppe Rossi, in a 2–2 home draw against Parma. During his debut he sustained an injury, causing him to be sidelined for three weeks. Rebić made three more appearances for Fiorentina before he scored his first goal on 8 January 2014, starting and scoring the second goal of a 2–0 Coppa Italia last-16 home win against Chievo Verona. On 18 May, he scored his first goal in Serie A in 2–2 draw against Torino at the Stadio Artemio Franchi, two minutes after replacing Manuel Pasqual. On 3 August 2014, Rebić joined 2. Bundesliga club RB Leipzig for a season-long loan deal. After his loan spell with Leipzig ended, Rebić returned to Fiorentina and was given the number 11 shirt, previously worn by Juan Cuadrado, and was used primarily on the left wing. He made his European debut with the club on 1 October in a 4–0 defeat of Belenenses in the Europa League. In their next match in that competition, Rebić was sent off for a reckless challenge in stoppage time in a 2–1 defeat to Lech Poznań. On 1 November, he scored his first goal in Serie A, in a 4–1 win against Frosinone. After only making six appearances and scoring once for Fiorentina, Rebić was loaned to Hellas Verona on 14 January 2016. However, he failed to score in nine appearances, and Verona were relegated to Serie B. On 20 March, on as a halftime substitute for Giampaolo Pazzini, he was sent off for two yellow cards at the end of a 2–1 loss to Carpi in the Stadio Marc'Antonio Bentegodi. Rebić joined Eintracht Frankfurt on a season-long loan on 11 July 2016, reuniting with former national team manager Niko Kovač. After a short battle with mononucleosis, Rebić made his debut on 17 September against Bayer Leverkusen, coming on as a substitute and assisting Marco Fabián for the winning goal in a 2–1 victory. On 5 February 2017 he scored his first goal for his new team to conclude a 2–0 win over fellow Hesse team SV Darmstadt 98 at the Commerzbank Arena. On 27 May, he equalised in the 2017 DFB-Pokal Final, though Frankfurt lost 2–1 to Borussia Dortmund. On 31 August 2017, Rebić joined Frankfurt a second time on loan for another year with an option to buy. Across all competitions, he scored nine goals and assisted three that season. This included two goals on 19 May in the 2018 DFB-Pokal Final, a 3–1 victory that gave his club their first cup since 1988 and denied Bayern Munich to complete their double. At the conclusion of the season, Eintracht Frankfurt exercised their option to purchase Rebić permanently for €2m. On 10 August 2018, Rebić signed a new contract to last until June 2022. He had been tracked by clubs including Manchester United, Tottenham Hotspur, Bayern Munich and Sevilla, and Frankfurt had lost several of their star players in addition to Kovač, who joined Bayern. Two days later, Frankfurt lost the 2018 DFL-Supercup at home to precisely that team, with Rebić a 64th-minute substitute. On 31 July 2013, Rebić was called up for the first time to the national team, ahead of a friendly away to Liechtenstein. He came on as a 63rd-minute substitute for Ivica Olić in the match, and four minutes later he scored in the 3–2 win. He was praised by manager Igor Štimac after the game. Upon the arrival of the new national team coach Niko Kovač, his former Croatia U21 coach, Rebić was called up for the decisive World Cup play-off matches against Iceland in November 2013. He came on as a substitute in both games, as Croatia secured their spot in the 2014 FIFA World Cup by winning 2–0 on aggregate. Rebić was named in Kovač's final 23-man squad for the tournament in Brazil. He took part in the opening match against the hosts in São Paulo, as a late substitute in a 3–1 defeat. He played the same role in the next two matches as the Croats were eventually eliminated from the group, and lasted only 20 minutes before being sent off versus Mexico in their last match for a studs-up tackle on Carlos Peña. 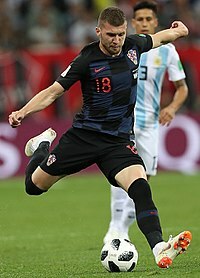 From June 2015 to November 2017, Rebić was not capped for Croatia. He was named in manager Zlatko Dalić's final squad for the 2018 FIFA World Cup in Russia. In the second group match against Argentina in Nizhny Novgorod, he volleyed after a mistake by opposing goalkeeper Willy Caballero to open a 3–0 Croatian win. In the last 16 against Denmark, he had a chance to score near the end of extra time but was fouled by Mathias Jørgensen; Luka Modrić missed the resulting penalty but the Croats won in the shootout. Rebić started in the final, and was substituted for Andrej Kramarić after 71 minutes of a 4–2 loss to France at the Luzhniki Stadium. As of match played on 24 March 2019. Croatia score listed first, score column indicates score after each Rebić goal. ^ "2014 FIFA World Cup Brazil: List of players: Croatia" (PDF). FIFA. 14 July 2014. p. 12. Retrieved 24 March 2018. ^ Kuzmanić, Dražen (28 September 2011). "Ante Rebić, imotski nogometaš u prvoligašu RNK Split". Imotske novine (in Croatian). Archived from the original on 31 March 2012. Retrieved 10 November 2011. ^ Rupnik, Borna (21 May 2011). "Naslov i Europa proslavljeni bodom". Sportnet.hr (in Croatian). Retrieved 10 November 2011. ^ Rupnik, Borna (23 May 2011). "Rebić: Hvala Obilinoviću na lopti". Sportnet.hr (in Croatian). Retrieved 10 November 2011. ^ Pavković, Božo (31 August 2011). "Ante Rebić sa Splitom potpisao ugovor do 2014. godine!". dalmacijanews.com (in Croatian). Archived from the original on 8 May 2012. Retrieved 10 November 2011. ^ Jones, Simon (16 August 2013). "Swansea rival Spurs and Fiorentina for Croatia striker Rebic". Daily Mail. London. ^ "Transfer news: Fiorentina complete signing of Croatian forward Ante Rebic". SkySports. 28 August 2013. Retrieved 28 August 2013. ^ "ANTE REBIĆ NA PREDSTAVLJANJU 'Nastojat ću biti dostojan Batistutinog dresa'". JutarnjiList. Retrieved 8 January 2014. ^ "Ante Rebić debitirao za Fiorentinu u remiju s Parmom". Večernji list. Retrieved 8 January 2014. ^ Farinola, Antonio (8 January 2014). "Coppa Italia, Fiorentina-Chievo 2–0: I viola volano ai quarti". La Repubblica (in Italian). Retrieved 21 June 2018. ^ "Fiorentina-Torino 2–2, Cerci sbaglia al 94' il rigore dell'Europa". La Repubblica (in Italian). 18 May 2014. Retrieved 21 June 2018. ^ "Ante Rebić na posudbi u Leipzigu" (in Croatian). Večernji list. Retrieved 4 August 2014. ^ "Fiorentina 4–1 Frosinone: Sousa's side join Inter at top of Serie A". Mail Online. Retrieved 8 November 2015. ^ Chloe_Beresford (14 January 2016). "Ante Rebic Joins Struggling Hellas Verona On Loan". Retrieved 17 August 2016. ^ Barzizza, Marco (20 March 2016). "Lasagna condanna il Verona e rilancia il Carpi verso la salvezza" (in Italian). Eurosport. Retrieved 21 June 2018. ^ "Ante Rebic Joined Eintracht". 11 July 2016. Retrieved 17 August 2016. ^ "Neue Unberechenbarkeit mit Fabian, Rebic und Co". kicker Online (in German). 18 September 2016. Retrieved 4 June 2017. ^ "Die Wuchtbrumme". Frankfurter Runschau (in German). 6 February 2017. Retrieved 21 June 2018. ^ "Borussia Dortmund's Aubameyang sinks Eintracht Frankfurt to land cup". The Guardian. Press Association. 27 May 2017. Retrieved 21 June 2018. ^ "Rebic Back in Frankfurt". Eintracht Frankfurt. 31 August 2017. Retrieved 21 June 2018. ^ a b Reeves, Bernie (21 June 2018). "Ante Rebic: who is Eintracht Frankfurt and Croatia's man for the big occasion?". Bundesliga. Retrieved 21 June 2018. ^ a b "Eintracht Frankfurt stun Bayern Munich to win DFB Cup final for fifth time". Bundesliga. 19 May 2018. Retrieved 21 June 2018. ^ "Croatian top player extended until 2022". Eintracht Frankfurt. 24 August 2018. Retrieved 10 August 2018. ^ Van Opdorp, Davis (11 August 2018). "Why Ante Rebic is the man Eintracht Frankfurt needed to keep". Deutsche Welle. Retrieved 20 August 2018. ^ "Bayern Munich thrash Eintracht Frankfurt to win DFL-Supercup". Eurosport. 12 August 2018. Retrieved 20 August 2018. ^ "Štimcu je Ante Rebić novi adut za Marakanu". Večernji list. Retrieved 16 August 2013. ^ "Iceland 0–0 Croatia". BBC Sport. 15 November 2013. Retrieved 22 June 2018. ^ "Croatia 2–0 Iceland". BBC Sport. 19 November 2013. Retrieved 22 June 2018. ^ "Croatia squad for 2014 World Cup: the 23 chosen by Niko Kovac". The Guardian. 5 June 2014. Retrieved 22 June 2018. ^ Smith, Ben (12 June 2014). "Brazil 3–1 Croatia". BBC Sport. Retrieved 22 June 2018. ^ Sanghera, Mandeep (23 June 2014). "Croatia 1–3 Mexico". BBC Sport. Retrieved 22 June 2018. ^ "World Cup 2018: Dejan Lovren named in strong Croatia squad". BBC Sport. 4 June 2018. Retrieved 22 June 2018. ^ James, Stuart (21 June 2018). "Argentina on brink as Ante Rebic sparks rout to put Croatia through". The Guardian. Retrieved 22 June 2018. ^ Hytner, David (1 July 2018). "Croatia send Denmark out of World Cup after Subasic heroics in shootout". The Guardian. Retrieved 2 July 2018. ^ "Ante Rebić". Retrieved 24 February 2019. ^ a b "Ante Rebić". European Football. Retrieved 22 June 2018. Wikimedia Commons has media related to Ante Rebić.